I had one of those days recently that unintentionally revolved around one actor, Peter Falk. These are almost always the best kind of days. The day began when I finally listened to a NPR interview with Falk that I had put on my iPod sometime after his death. For twenty minutes, Falk and his distinct voice discussed his life and career. ( A glass eye! I never realized that!) I have to admit that I haven’t seen many of Falk’s movies. Only The Princess Bride, Wings of Desire, and A Woman Under The Influence. I barely remember the latter two. After I listened to the interview, I realized that the movie I was planning to watch that night was Murder by Death. It’s an ensemble comedy starring Falk, Alec Guiness, Peter Sellers, David Nivens, Maggie Smith, and Truman Capote. The actors parody the most infamous detectives – Hercule Poirot, Miss Marple, Charlie Chan, Nick and Nora Charles, and Sam Spade. Falk, channeling Sam Spade easily steals the movie. (And Truman Capote, because anytime Truman Capote is being absurd is a great time.) Falk’s character is a wonderful caricature of the infamous character. What happens when these five detectives, the best in the world, are invited to a mysterious house to solve a crime that hasn’t happened yet. 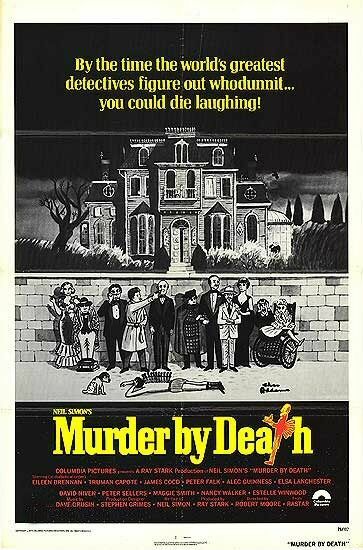 Murder by Death happens. It’s hilarious. If you’ve ever read even 1/3 of an Agatha Christie novel or seen 1/3 of The Maltese Falcon, you will die laughing. Watch it. You won’t regret it. Yay I’m so glad you liked it! This is one of my favorite movies and I try to get people to watch it because it is so good!